Learning and singing songs is lots of fun. As a student, learning lyrics is a lot more fun than memorizing vocabulary lists, so if you're learning French, check out some French Christmas carols. Songs often sung at church during Advent are Christmas songs commonly sung in France, just like some of the Christian songs in English that have made it into the mainstream culture, such as 'O Holy Night'. An upbeat song as far as Christian songs go, this one is a delight to hear and to sing along. One of the most beautiful Christmas songs of all time whether sung in a church or on a stage. Check out this Rufus Wainwright live version if you're a fan of his work or looking for a contemporary singer singing this classic Christmas song. This religious song borders on the brink between traditional Christmas hymn and a mainstream holiday song. Most will recognize the English title 'Bring a Torch, Jeanette Isabella'. This instrumental version is especially lively. Christmas is lots of fun for children; in addition to the songs that surround the religious history of Christmas, a long list of children's songs can be heard playing in schools, homes, and just about every store during the holiday season. Do you recognize this title as 'Rudolph, the Red-Nosed Reindeer'? A fun Christmas song for children who speak all languages, this song will remain a classic for generations to come. Listen to Le petit renne au nez rouge on you tube to see how many words you can understand. This sweet lullaby is exclusively for the Christmas season. This song's sweet, lilting sound lulls many children to sleep during the holidays. Unlike many French Christmas songs, this song does not have an English equivalent song; enjoy the original French lyrics as sung by French or Québécois singers. The French variant of 'Oh Christmas Tree', borrowed from the German song 'O Tannenbaum' is another sweet-sounding holiday song loved by adults and children alike for its gentle harmony.Nana Mouskouri sings the musical ode very beautifully. "Chants de Noel", or French Christmas carols, provide the soundtrack for a variety of celebrations. 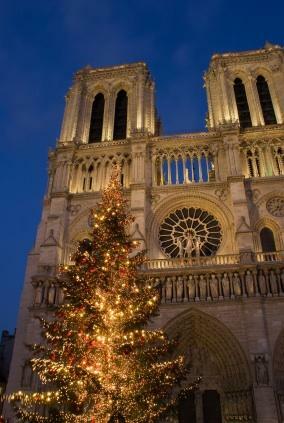 France is predominately Catholic, so many Christmas celebrations are centered in the church. But, on December 6th, St. Nicolas may be bring treats and gifts. Families attend Mass on Christmas Eve, and celebrate though Christmas Day. Here are a few songs you may hear during mass or performed by carolers. This reverent 15th century carol has the Christ child acknowledging the Lord. Here's a small sample. The singer asks the shepherd, "Where are you coming from?" and the shepherd recalls the miracle in the stable. Listen to a snippet sung by children. This traditional French Christmas carol was eventually translated to "Angels We Have Heard on High". It sounds even prettier in its original form. This solemn carol announces the arrival of the new king. Listen to a sample from a men's chorus here. As you review different lists of French Christmas Carols, you may notice a few familiar tunes. Many holiday songs popularized in English are enjoyed throughout the world, and it's interesting to hear the slight changes to lyrics or melody, but be able to hum along anyway. You'll notice familiar lyrics and melody in this French sample of "Silent Night". Review the lyrics and listen to a chorale performance. This rendition of "Jingle Bells" in French is one that children would love to learn to sing. Take a listen. Es Petits Chanteurs features a wide variety of French holiday songs and other classics. En la Fete de Noel - O Holy Night is performed by many artists. A French Christmas is a CD by American singer CC Couch. Noel, Noel! : Noels Francais/French Christmas Music (1200-1600) features a wide selection of classic French carols with a medieval tone. Chants de Noel is a collection of popular Christmas songs by French artists. Since France is a predominantly Catholic country, Christmas is an important holiday. For this reason, there's a large selection of French songs for the holiday season, much like the extensive list of English Christmas songs. Christmas is a traditionally family holiday in France, with families eating big meals together and attending church services together. Of course, like many traditions, the French traditions surrounding Christmas are slowly changing as new generations create their own traditions. Whether or not families still go to church together on Christmas may change in the near future, but Christmas carols will most likely still be sung!